While most random-orbit sanders have a single round pad, the new Rockwell RK4248K (about $70) employs dual-pad technology for faster, more efficient results. The tool comes with a 15-piece accessory kit that includes five sets of hook-and-loop abrasive rings, plus discs in three different grits: 60, 120, and 180. 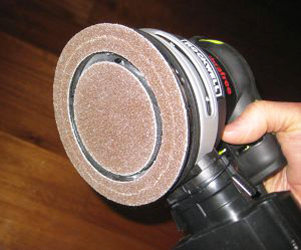 It has two sanding surfaces – a 5" diameter outer abrasive ring, and a 3" inner pad. It also features a unique vibration-dampening feature known as Vibrafree, which redirects much of the tool’s energy toward the sanding surface instead of the user, thus reducing fatigue. Other features include a powerful 3.3 Amp, variable-speed motor (6,000 to 13,500 orbits per minute); a "super-efficient" dust collector that uses cyclonic action to capture 50% more dust and particles than competitive sanders; and an adapter for connecting the sander directly to a wet/dry vacuum. The compact, low-profile body is only 5-1/2" tall and delivers a 1/8" diameter orbital action for smooth, swirl-free surfaces. There's a dust-sealed toggle switch, variable-speed control wheel, and a three-year limited warranty. 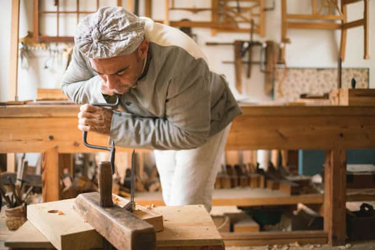 Workmanship of Risk: Exploring Period Tools and Shops is the theme of the 20th annual Colonial Williamsburg conference that takes place from January 25th through the 28th. From turned, green wood chairs to elaborate marquetry pieces, pre-industrial furniture in America took many forms and sprang from numerous traditions. With each tradition came different sets of tools, shop structures, and approaches to solving problems in a common material, wood. For this 20th annual conference, CW has brought together an impressive group of presenters to speak to some of these different traditions, with an emphasis on shops and tools. On the website, go to Learn, and then Conferences, to find out more. The event is sponsored by Fine Woodworking, the Society of American Period Furniture Makers, and the Early American Industries Association. The sidewalk outside the WoodEzine office is kept free of snow by a battery powered snowblower from a company named Greenworks Tools. The blower is powered by a 40 Volt Li-ion battery, and it does a surprisingly good job. The company also makes battery powered air compressors such as the 40 Volt 1/2 gallon oil free model shown at left, plus lawnmowers, chainsaws, drills, circular saws, reciprocating saws and even a self-propelled cordless wheelbarrow! 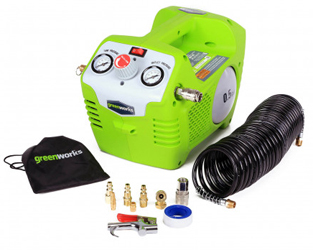 Greenworks has 24, 40, 60 and 80 Volt batteries, and commercial grade 82 Volt landscaping equipment, plus a full line of corded equipment. Founded in 2007, the company's North American headquarters is in the historic Cotton Mills complex in downtown Mooresville, North Carolina. This week the News Herald in Morganton reported that Sunrise Global Marketing LLC, manufacturers of Greenworks Tools, plans to invest $10 million in a distribution facility that will create 187 new jobs in that North Carolina community. Stanley Black & Decker currently operates some thirty manufacturing facilities in the U.S. including three in Connecticut, and more than 100 globally. The company has three locations designated as Lighthouse Factories that have partially implemented Industry 4.0 across their facilities, from manufacturing execution systems (MES) to 3-D printing, virtual reality and artificial intelligence. This month, the company announced plans to open an Advanced Manufacturing Center of Excellence in downtown Hartford, Connecticut to accelerate its global Industry 4.0 smart factory initiative. 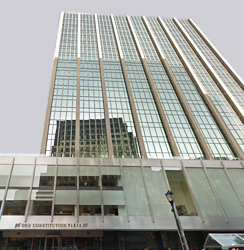 Called Manufactory 4.0 after the original Stanley Bolt Manufactory founded in 1843, the 23,000-square-foot center will be located at One Constitution Plaza (shown at right), and will employ about fifty professionals. Stanley has appointed Sudhi Bangalore, most recently WIPRO's global head of smart manufacturing and Industry 4.0 solutions, to lead the new center. The company is also launching an additive manufacturing accelerator with Colorado based Techstars, and that, too, will be housed at the new facility. 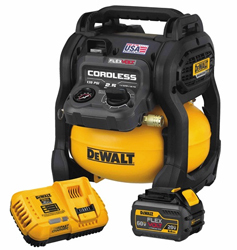 For finish nailing, DeWALT came out with a new 2.5 gallon cordless air compressor last fall that installers and trim carpenters are giving a thumbs up. The 0.4 HP compressor (item DCC2560T1) is not going to replace a framing outfit, but for pins and trim nails it seems to be an excellent choice. The company says that this new member of the Flexvolt® 60V MAX family will drive up to 1,220 nails on a single charge, using one DCB606 battery and a DeWALT brad nailer (tested using a model DWFP12233). And reviews by woodworkers tout the OneTurn™ regulator that eliminates the traditional dial and delivers fast, accurate pressure adjustments. A brushless motor, paired with a heavy duty oil-free pump, provides all the power most woodworkers will need (1.2 SCFM @ 90 psi and 1.5 SCFM @ 40 psi). For jobsite use, it's only 21.5 lbs and 15-1/2" tall, plus its heavy duty roll cage offers good protection. It's relatively quiet at 79 dBA. The DCC2560T1 is made in the USA with global materials. 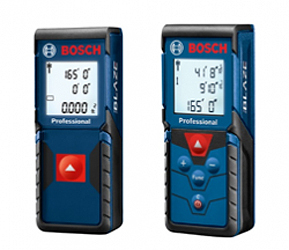 November saw two new pro additions to the Blaze™ family of laser measuring devices. The new One and Pro models from Illinois based Bosch USA both deliver precise laser measurements with a 165 ft. range that is accurate to 1/16". The One (left) is a one-button tool with an Auto Square function that automatically calculates square footage for determining room sizes and doing estimates. The Pro is a fully featured, simple-to-use tool that delivers real-time point-and-shoot measurement, plus area, volume, indirect measuring functions and a 10-measurement storage capability. The laser measure also includes addition/subtraction functionality. Bothg models also have an easy-to-read backlit display, allowing work in low-light or no-light conditions. And both tools are built to withstand rainy or dusty jobsite conditions (they have an IP54 rating). They also have a handy wrist strap, target cards and a pouch. Integra Doors is a manufacturer of MDF products in Greer, South Carolina - most notably, powder-coated doors. The company has recently expanded its line of in-house powder colors. Gray Screen (which matches Sherwin Williams 7071) joins the stock colors Frosty, True White, Creamy and Pepperdust. 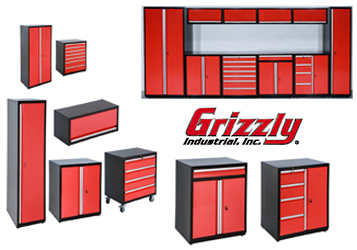 Integra Doors can powder-coat custom cabinet doors and other MDF parts in almost any color a client can specify, and has been doing so for 3-1/2 years now. The process has many unique qualities: a powder-coated door doesn't fade, yellow, wear off, become gummy, or emit harmful chemicals into the environment. Powder will not melt or fall off cabinet doors. And perhaps best of all, an MDF door that has been powder coated is quite water resistant, so it's ideal for specialty applications such as labs and commercial kitchens. 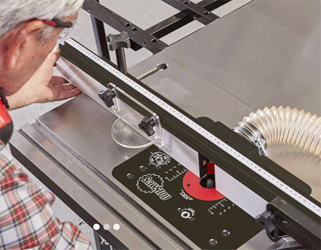 The Accu-Cut™ from Kreg Tool turns a standard circular saw into a track system. It lets a woodworker rip, cross-cut and make angled cuts up to 48" long in plywood, MDF and panels. It will even stay in place without clamps for most cuts, thanks to anti-slip strips. There's an anti-splintering mechanism too, and a Starting Block that supports the saw and allows normal blade guard operation. It will accept almost any circular saw, whether it cuts left or right of the blade, and it's a perfect jobsite solution where a table saw isn't available, or convenient. 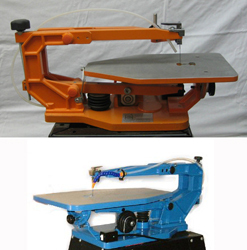 PS Wood Machines, based in Bethel Park, Pennsylvania, is currently offering free shipping on both of its scroll saws - the 14" (orange, $549) and the 21" (blue, $799) model. Both saws have constant tension parallel arms, which means that both arms move up and down together. The saws are belt driven, and the 21" saw has one of the largest table on the market. With safety in mind, the upper arm pops up when a blade breaks, so it doesn't continue to cut. Everything about changing a blade on these tools, and it can be done in approximately fifteen seconds. The saws are made from cast aluminum except for the arms on the 14" model, which are made from extruded aluminum. The larger saw has five speeds and in addition to wood it can cut metals, glass, Plexiglas™, solid surface materials, bone and other products. The 14" saw has three speeds and is designed for wood: it runs too fast to cut glass or metal. Both tools come with a 5-year unconditional warranty, and both are virtually maintenance free because they have bronze self-lubricating bushings and sealed ball bearings are sealed. The larger machine is machined and assembled in the US, and the smaller one is totally manufactured in the US. 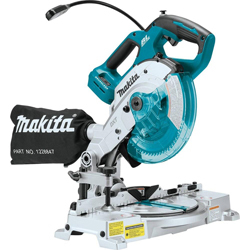 Last month Makita® USA announced more than twenty new tools and accessories at the annual Specialty Tools & Fasteners Distributors Association (STAFDA) trade show, which was held at the Austin Convention Center in Texas. Front and center was Makita's Auto-Start Wireless (AWS) system, which uses Bluetooth™ technology for wireless power-on/off communication between a tool and a vacuum/dust extractor. This intelligent communication system eliminates cords and reduces noise, since the vacuum is trigger-activated. Among the new tools coming down the pike that use AWS is the 18V LXT brushless 6-1/2" compact compound miter saw (XSL05Z, shown at right). It will be available in winter 2018, and comes with a laser on board. It weighs in at just 14.6 lbs. with the battery, so installers are going to be pleased with its jobsite portability, and its performance: the XSL05Z delivers up to 270 cuts per charge in 1/2" x 3-1/2" baseboard, using one 18V 6.0Ah battery. 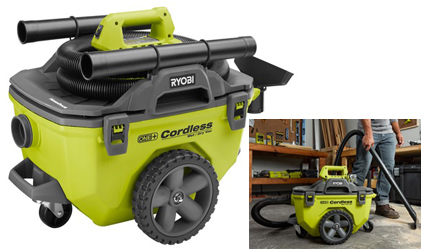 The newest ONE+ tool from Ryobi is a 6-gallon wet/dry vacuum that delivers corded performance with cordless convenience. Available at The Home Depot ($99 without batteries, SKU 1002707936), it draws 80 CFM and weighs just 15 lbs. The large wheel design keeps it balanced when rolling over cords, thresholds and small shop debris. On-board storage holds a crevice tool, floor nozzle and extension wands, while a clever dock stores the hose when not in use. Multiple carrying handles allow for easy carrying, and the removable top makes emptying dust, debris and even liquids quick and mess free. The ONE+ cordless lithium-ion system now features over 100 power tools. RYOBI has never changed, and says it will never change, the 18V ONE+ battery platform, so the company's newest products and batteries fit original versions all the way back to 1996. For woodshops that outsource European style drawers, Titus+ has added the new Tekform slimline drawer that features 14mm (0.55") side panels to make maximum use of the drawer opening. Various finishes are available to match any contemporary design. This family of double wall drawers includes a simple mounting procedure and the Titus damper. That's integrated in all Tekform drawers and provides reliable, fast, gentle, silent, safe and consistent soft closing (no wonder it's called 'Confident Close'). The drawers also have a fast and simple EasyFix locking system that lets a shop install or remove the front with a quarter turn of a screwdriver. And perfect drawer alignment is accomplished with an intuitive and simple vertical and horizontal procedure. 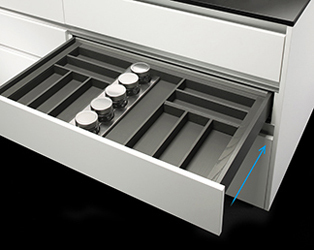 Any Tekform drawer can host accessories for cutlery and internal partitions, all of which which can be easily installed thanks to clipping features. For more info, watch the video. Arizona Silhouette is a woodturning supply house based in Pennsylvania, and run by noted turner Barry Gross. 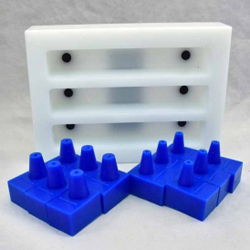 The company has introduced a new solid block HDPE (high density polyethylene) mold for pouring pen blanks. Designed not to warp or crack, they are CNC precision milled and do away with leaking joints and screws that can strip in older HDPE molds. They will take the abuse of daily casting, and won't warp or crack as traditional silicone molds can. 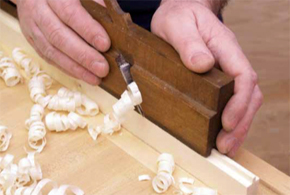 A woodturner can pour large single blanks, or use the plugs to make smaller individual blanks (6 large and 6 small are included, and more can be purchased). Cataloged as item ME525C, it has overall dimensions of 6.5" x 4.5" x 1.5" with three casting chambers, each measuring 5.25" x 0.84375" x 1". The blanks can easily be end-trimmed and squared up on a table saw, if so desired. The comapny also supplies the resin. Art meets science in a couple of fairly new variable speed lathes from Colt Tools. 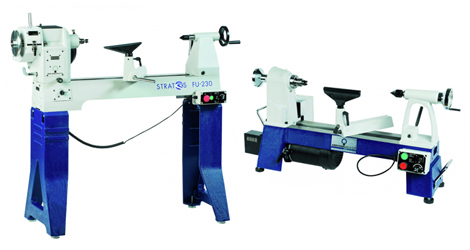 Woodturners and engineers got together to create the Stratos CO-230 (2 HP/230V motor, forward/reverse, swivel/sliding headstock, 80 to 3,700 RPM, 1-1/4" x 8 thread, 20" swing over the bed, 31" outboard) and the benchtop midi SML-350. The latter has a 13-1/2" swing, cast iron construction, forward/reverse, magnetic moveable controls, 1" x 8 thread, #2 Morse taper, and a 1 HP TECF motor. The lathes are available through Arizona Silhouette in Pennsylvania, Bradley McCalister (Bradley R.M.) in Georgia, and Johannes Michelsen in Vermont. One T27949 2 door closet, a T27948 2 door cabinet, a T27947 7-drawer tool cabinet, a T27952 single drawer 2 door cabinet, a T27951 single door 4 drawer cabinet, a T27950 single door cabinet, and four T27953 hanging wall cabinets. The price for the 10-piece set is $2,495 plus $525 shipping ($3,020). 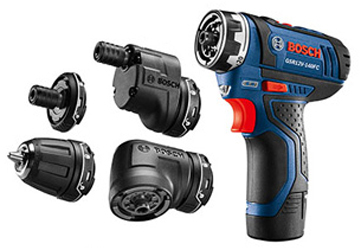 The clever new Bosch 12V Max FlexiClick™ 5-In-1 drill/driver system fits into tight cabinets, has an offset head, and even pokes around corners. It's an installer's dream tool. At just 1.8 Lbs but with 265 inch pounds of torque, it delivers lots of punch in a small package. It has two speed settings for quick jobs or precision work, and starts with a standard magnetic bit holder. From there, the four attachments – a locking bit holder, a keyless chuck, an offset angle and a right angle – each attach to the tool securely and easily with a simple clicking mechanism. The right angle attachment is for tight spaces, and it works with all three other adapters. The offset angle attachment delivers precise screwdriving close to edges. Both of these attachments rotate to 16 positions without removing them. The locking bit holder attachment locks hex bits for high-torque drilling, while the keyless chuck provides locked-in drilling. 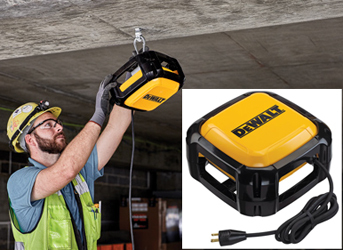 DeWALT has launched a new device called the Jobsite WiFi Access Points (DCT100), which is made in the USA with global materials. Built to withstand construction site conditions, it delivers reliable internet access using a company's existing ISP. With an operating temperature of -4F to 122F, it's IP67 rated against dust and water submersion. A mobile app, coming soon, will provide detailed steps for simple setup without a technician. With both vertical and horizontal mounting options, it self-heals and adapts to keep users connected to their data. Woodworkers on remote jobsites are now able to access files such as 3D models, construction software, change orders, punch lists, collaboration tools and photo documentation. Each Access Point operates on 120V AC power and provides WPA2 encryption via SSL for security. MSRP is $1,499. 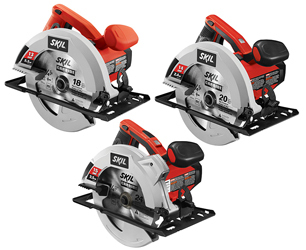 A new family of 7-1/4" corded portable circular saws from Skil (named the 5080-01, 5180-01 and 5280-01) offer the handyman some choices in power and weight. The tools are 13, 14 and 15-Amps respectively (2.3 HP, 2.4 HP and 2.5 HP). To reduce operator fatigue, all three have been designed to be significantly ligher than Skil's standard workhorse, the 5480. They also have improved dust blowing and a 51° bevel, with a positive stop at 45°. The 5280 also has a single beam laser for more accurate cuts, and it comes with a carrying bag for jobsite portability and storage. Blade changes are easy on all three saws with a spindle lock and on-tool wrench storage. The 5180 and 5280 both come with a 24-tooth carbide tipped blade, while the 5080 has an 18-tooth blade. The smaller model weighs in at just 6.96 lbs, and the bigger tools are still very light at just 7.2 lbs and 8.7 lbs. In celebration of its 10th anniversary, Next Wave Automation is offering free plans and VCarve files for making a rather unique commemorative chess set. 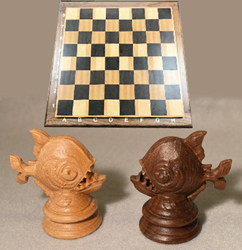 Instructions and design files for the chess board and the first piece, the Piranha Pawn, are already available (at no charge) on the company’s website. Since its introduction in 2007, Next Wave Automation has developed an entire line of Desktop CNC machines and accessories, and has won several industry awards for its innovative products. 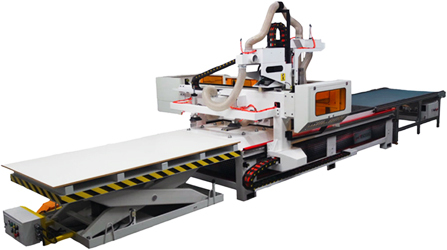 The range runs from the CNC Piranha to the CNC HD4 Extended, and the original CNC Shark, which is an affordable, made-in-the USA, full-function CNC machine for hobbyists and small shops. The commemorative chess set can be made using any of the company’s CNC models by taking advantage of the double-sided machining available in Vectric’s new V9 Software. Based in Perrysburg, Ohio, the company will upload instructions and design files for a new chess piece every month. 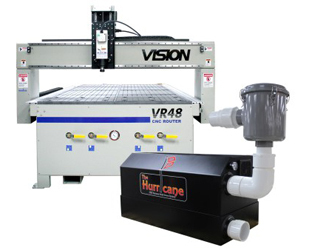 Vision Engraving & Routing Systems has announced that their CNC routers with a vacuum table option will now come with a Black Box vacuum system. The Storm system will be packaged with Vision's 2550, and the larger Hurricane (shown) will serve the VR48. Made in the USA, Black Box Vacuums are single phase systems. The Storm vacuum pump has two powerful motors working in tandem to produce approximately 5 psi of pressure. The Hurricane pump offers a unique two-stage design that allows a woodshop to choose between two or four motors at the press of a button. "When two manufacturers build quality products at reasonable prices," says Vision president Joe Ivanenok, "the customer wins. Plus, Black Box single phase systems will save shops the cost of installing 3-phase." According to the company, Vision is the largest engraving machine manufacturer in the USA. Precision Drive Systems (PDS, 704-922-1206), based in Bessemer City, North Carolina, is a global provider of high-speed precision spindle motors. The company has launched a new online store where rebuilt spindles are completely broken down, reassembled, tested and then backed by a six-month warranty. Consumables in the store include collets, collet nuts, grippers, pull studs, spindle service kits, tool forks, tool holders and wrenches. The company manufactures automatic and manual tool-change spindles, plus 5-axis heads, under its own PDS brand. It also offers spindles from Giordano Colombo, Hiteco and Spintec. European customers are served by a PDS office in Lohne, Germany, and there are six other affiliate offices around the world. 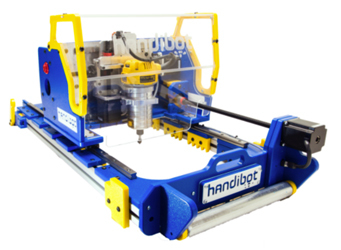 The new Handibot® Large Sheet Tool can perform precise and easily repeatable cutting, carving, machining, and milling operations in wood, MDF, plastics, foams and aluminum. Optimized for tiling, it can break cuts into 'tiles' and then move across the material, stopping to cut out each tile as it goes. The cut length is 24", which means the tool can cut a full depth cabinet. The Large Sheet Tool is take-anywhere portable: it can be moved across the shop or the country. And its software, FabMo, is a built-in digital fabrication and motion control system that gives shops the robust power of CNC technology, while reducing the challenges. An operator doesn't need to know how to use CAD or CAM software: he/she can simply use apps to make projects, and run the tool to do simple jobs. Or the company provides access to VCarvePro ShopBot Edition, and Autodesk Fusion360. FabMo also lets a woodworker control and monitor the tool from any WiFi-enabled device - a Mac, PC, Android, iOS phone or any tablet. This is wireless CNC! SawStop, based in Tualatin, Oregon, is introducing a new family of router tables. Pricing and availability will be coming in early 2018, but woodworkers can visit the company's website now and explore the range. There's a cast iron Benchtop table with a powder-coated tubular steel benchtop-height stand; a 32" x 24" cast iron or phenolic Standalone model, again with a powder-coated tubular steel stand; and an Inline table that fits the company's Professional, Industrial or Contractor model saws. Reflecting the quality that SawSyop is known for, the Inline Table is cast iron and fits between the rails in place of the extension table (for older saws, retrofit rails will be required). The Inline table fits to the left of the blade, and has internal channels, an external power switch for the router, two support legs and a fence with two adjustable faces, and shims. There is also a 2-1/4" dust port, adjustable inch scales, and compatibility with various routing accessories such as featherboards and flip stops. The company also has a new Router Lift (at the bottom of the same web page). The Python XPR from CNC Factory boasts the latest robotics in CNC technology. 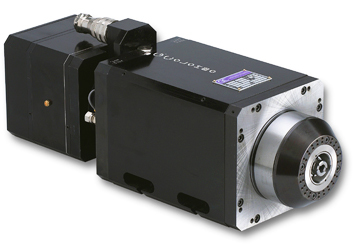 The HSD 12HP air-cooled spindle and rotary ATC 12-Tool carousal produces rapid travel of over 1800 inches per minute. The PYTHON will complete long, complex multi-tool tasks efficiently, from one sheet to fifty sheets, automatically at the push of a button. Ergonomic and user-friendly, it requires only one operator, eliminating many of the physical requirements associated with high output sheet fabrication. It changes tools in just 4 seconds! The Python XPR has Delta powered direct helical rack and pinion gearing, a dual layer high flow vacuum system, works in manual or robotic mode, and eliminates heavy lifting with robotic loading and unloading. Watch the demo on YouTube. 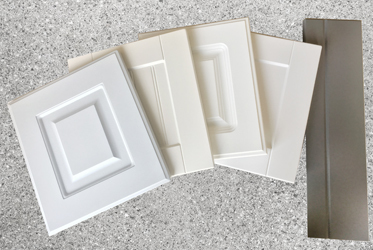 Bainbridge Mfg, Inc. in Waterville, Washington has introduced several new cabinet hardware solutions. 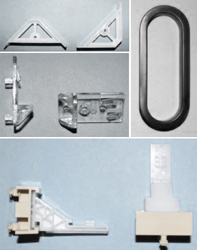 Among them are the #1610 high strength budget corner brace (top left, $3.16, 4-pack) that measures 2-1/2" x 2-1/2", and can be stapled in place to reinforce corners. It comes with the countertop screw hole already drilled. The #3206 heavy duty shelf support (center left, $6.32/8 - $17.00/100) has dual 5mm pegs that are spaced 32mm apart vertically, and it holds 3/4" or 1" thick shelves. There's a center hole so a screw can be attached underneath the shelf. Bainbridge's #1106 oval finishing grommet (top right, $6.25 with quantity discounts available) fits a 6-1/8" X 2-1/8" hole, and has a 1/4" lip. It's molded in high impact polystyrene, accepts most glue and paint, and can be ordered in custom colors. And the #694 undermount socket (bottom, $5.98/2 and $36.00/100) has a 3-3/8" long adjustable socket with a 15mm thick frame and two 8mm centered ultra-grip pegs for Hettich Quatro V6 undermount drawer slides. There is a downloadable catalog. WestPine is re-introducing its moisture resistant MDF, EcoPlus MR50, which is available through all Hardwoods Specialty Products and Frank Paxton Lumber locations nationwide. 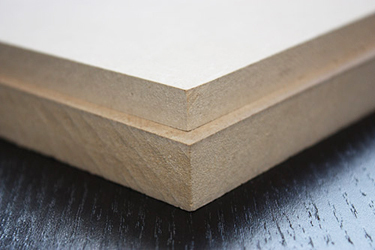 In addition to smoothness and stability, the moisture resistant MDF is formulated to endure humid conditions. This makes it a perfect substrate for commercial applications in food service industries, institutional buildings and healthcare establishments. It is also well suited to residential interiors such as kitchen and bath cabinetry, interior storage, moldings and millwork. EcoPlus MR50 is composed of 100% Western white softwoods that have a consistently light, sandy color. It is ideal for use with decorative surfaces, including reconstituted or natural wood veneers, TFL and HPL, and it machines like premium grades of MDF. The panels are available in 1/2, 5/8 and 3/4" thicknesses, are FSC controlled, and can help projects on LEED points. New Jersey's Top Knobs has introduced its new Hopewell Bath Collection, and the flat black finish is designed to add style, function and personality to any bathroom. The matte look and feel combine with soft, rounded edges to deliver both style and drama to bathroom designs. 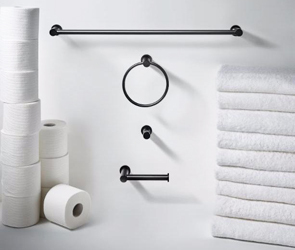 The collection includes double and single towel bars, single hooks, bath tissue holders, tissue hooks and towel rings, for a wide range of functional bath accessories. In addition to Flat Black, the ten-product collection is also available in Brushed Satin Nickel, Oil Rubbed Bronze, Polished Chrome and Polished Nickel finishes. MSRP for the series is $33.00 to $171.00 per piece, and it's available at kitchen and bath showrooms nationwide. All Top Knobs products come with a proprietary sealed finish and a lifetime warranty, and the lines are only available through showrooms. The company offers 30 product collections and 37 finishes of kitchen and bath decorative hardware and accessories.